IKEv2, or Internet Key Exchange v2, is a protocol that allows for direct IPSec tunneling between the server and client. In IKEv2 VPN implementations, IPSec provides encryption for the network traffic. IKEv2 is natively supported on new platforms (OS X 10.11+, iOS 9.1+, and Windows 10) with no additional applications necessary, and it handles client hiccups quite smoothly. This article will guide you through the steps to set up an IKEv2 VPN server using StrongSwan on an Ubuntu 16.04 server and connect to it from Windows, iOS, and macOS clients. First, we'll install StrongSwan, an open-source IPSec daemon which we'll configure as our VPN server. We'll also install the StrongSwan EAP plugin, which allows password authentication for clients, as opposed to certificate-based authentication. We'll need to create some special firewall rules as part of this configuration, so we'll also install a utility which allows us to make our new firewall rules persistent. Note: While installing iptables-persistent, the installer will ask whether or not to save current IPv4 and IPv6 rules. As we want any previous firewall configurations to stay the same, we'll select yes on both prompts. An IKEv2 server requires a certificate to identify itself to clients. To help us create the certificate required, StrongSwan comes with a utility to generate a certificate authority and server certificates. To begin, let's create a directory to store all the stuff we'll be working on. Now that we have a directory to store everything, let's generate our root key. This will be a 4096-bit RSA key that will be used to sign our root certificate authority, so it's very important that we also secure this key by ensuring that only the root user can read it. You can change the distinguished name (DN) values, such as country, organization, and common name, to something else to if you want to. The common name here is just the indicator, so you could even make something up. Later, we'll copy the root certificate (server-root-ca.pem) to our client devices so they can verify the authenticity of the server when they connect. Now that we've got our root certificate authority up and running, we can create a certificate that the VPN server will use. We'll now create a certificate and key for the VPN server. This certificate will allow the client to verify the server's authenticity. Finally, secure the keys so they can only be read by the root user. In this step, we've created a certificate pair that would be used to secure communications between the client and the server. We've also signed the certificates with our root key, so the client will be able to verify the authenticity of the VPN server. Now that we've got all the certificates ready, we'll move on to configuring the software. We've already created all the certificates that we need, so it's time to configure StrongSwan itself. Save and close the file once you've verified that you've configured things as shown. Now that we've configured the VPN parameters, let's move on to creating an account so our users can connect to the server. We need to tell StrongSwan where to find the private key for our server certificate, so the server will be able to encrypt and decrypt data. First, we'll tell StrongSwan where to find our private key. your_username %any% : EAP "your_password"
Now that the VPN server has been fully configured with both server options and user credentials, it's time to move on to configuring the most important part: the firewall. Now that we've got the VPN server configured, we need to configure the firewall to forward and allow VPN traffic through. We'll use IPTables for this. To prevent IP packet fragmentation on some clients, we'll tell IPTables to reduce the size of packets by adjusting the packets' maximum segment size. This prevents issues with some VPN clients. Finally, we'll enable packet forwarding on the server. Packet forwarding is what makes it possible for our server to "route" data from one IP address to the other. Essentially, we're making our server act like a router. You'll get disconnected from the server as it reboots, but that's expected. After the server reboots, log back in to the server as the sudo, non-root user. You're ready to test the connection on a client. Copy this output to your computer, including the -----BEGIN CERTIFICATE----- and -----END CERTIFICATE----- lines, and save it to a file with a recognizable name, such as vpn_root_certificate.pem. Ensure the file you create has the .pem extension. Once you have the vpn_root_certificate.pem file downloaded to your computer, you can set up the connection to the VPN. 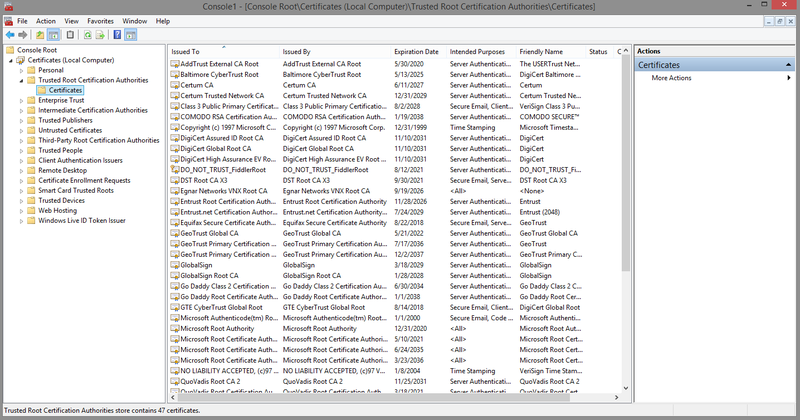 From the Action menu, select All Tasks and click Import to display the Certificate Import Wizard. Click Next to move past the introduction. On the File to Import screen, press the Browse button and select the certificate file that you've saved. If you are unable to import the certificate, ensure the file has the .pem extention, and not .pem.txt. We've successfully built a VPN server that uses the IKEv2 protocol. Now you can be assured that your online activities will remain secure.